A few days ago I went to Sally Beauty Supply and this nail polish caught my eye so I had to buy it. 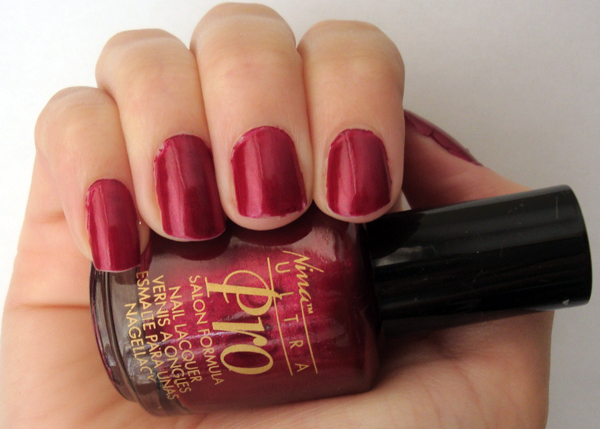 It is by Nina Ultra Pro in the colour Sangria #709018. Like every time I do my nails I applied a basecoat, two coats of colour and then a top coat. I am actually impressed with the nail polish for only being $3.99. It is now the third day that I have been wearing Nina Ultra Pro and it hasn’t really chipped. I usually have my nail polish chipped within a few hours. I did touch up the tips on a few of my nails from just normal wear and tear, but nothing major at all. I will definitely be buying more of this line. I think that this rich, dark colour is great for the fall season, especially the Christmas season. The nail polish really resembles the colour of sangria to a tee, hence the name. You can buy this nail polish online here or at your local Sally Beauty Supply store. What is your favorite nail polish colour for the fall season? Let me know in the comments below. Check out other nail polish reviews and swatches here. I LOVE THE COLOR SANGRIA. I WOULD LIKE TO ORDER THIS NAIL POLISH ON LINE, BUT IT WON’T LET ME. I checked on Sally’s website and that colour is no longer available. Maybe you can find something similar to it in another brand.